“Much Ado About Nothing” cast members, from left: Patrick Rostock (Don Pedro), Ed Palmer (Benedick), Kat Parker-Smith (Beatrice), Morgan Wilson (Hero), Logan Bennett (Leonato), Jesseca Wirtz (Margaret) and Sara Hutchens (Ursula). Free, outdoor public performances will be held June 21-25, starting at 8 p.m., weather permitting. This will be the second production at the new outdoor “grove” platform, located behind the Pass Building on TCC’s Chesapeake Campus, 1428 Cedar Road. 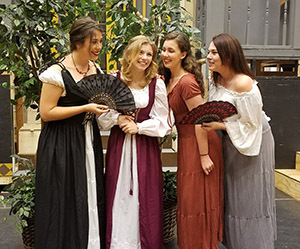 A cast and crew of more than 20 students and veteran actors and 14 technicians will bring this popular William Shakespeare comedy to life. “We are excited to be entering our third decade of Shakespeare in the Grove. It’s a Chesapeake tradition and community treasure,” said director Trey Clarkson, a TCC alumnus and high school theater teacher who starred in the first Shakespeare in the Grove production in 1996. Shakespeare in the Grove is sponsored by TCC and the Chesapeake Fine Arts Commission. Guests are encouraged to bring lawn chairs, blankets and a picnic dinner; insect repellent is also recommended.